All elements are made of atoms which combined with each other form new atoms. They come together in large or small numbers to form very similar or very different atoms and as a result of the combination it is known as a chemical bond. Atoms linked together by bonds have different properties to the original parent atoms. There are only about 100 chemically different types of atoms which make up millions of substances in the world by being combined together. The two main types of chemical bonds the ionic bond in compounds which occurs between a metal and a non-metal and the covalent bond occurring between the two atoms of non-metallic element or between different elements of two atoms. The oppositely charged ions are held together by the strong attraction forces that during ionic bonding form the positive and negative ions. As a result of these bonds between the charged particles a giant structure of ions is formed. To break all the bonds would take a lot of energy as the ions in the giant structure are being held together strongly; therefore the ionic compounds have a high boiling and melting points. Sodium chloride is a good example of an ionic substance. It is known as NaCl or common salt and by being a crystalline solid it has a high boiling point of 1413oC and melting point of 801oC. 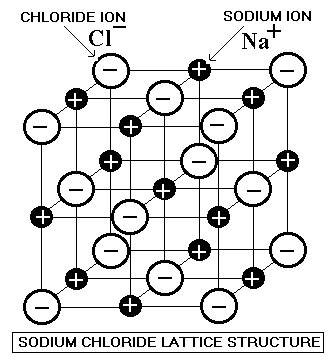 Below is a diagram of a sodium chloride giant ionic structure. Covalent compounds at a room temperature can be found in a form of a solid, gas or water and in a solution generally do not conduct electricity. Two chlorine atoms form a non-polar covalent bond by being equally shared as the difference in electronegativity between them is zero. Covalent bonds that have unequal shared electrons between the atoms is a polar bond. Dispersion (also known as Van der Waals’) forces exist between all molecules polar or nonpolar and without these forces; nonpolar molecules cannot ever form a solid or a liquid. Molecules with more electrons will generate bigger oscillating and induced dipoles. These produce larger attractive forces between molecules. 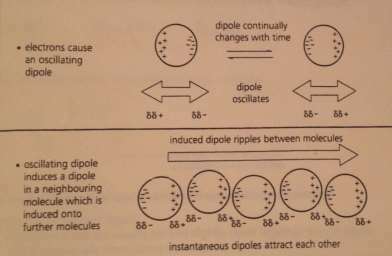 A dipole-dipole interaction is when a polar molecule will attract another polar molecular by the small δ+ and δ- charges. This gives a weak intermolecular force called a permanent-dipole interaction. Below is an example of intermolecular forces between Hydrogen and chlorine molecules. There are special properties of water arising from hydrogen bonding. Solid is less dense than liquid, therefore particles in solids are usually packed slightly closer together than in liquids. Relatively strong hydrogen bonds hold water molecules apart in an open lattice structure. Below is an example of an open hydrogen-bonded lattice of ice as ice is less dense than water. Hydrogen bonds have a high melting and boiling point, therefore there’s a relatively strong attraction of H-bonds and H2O. The H-bonds are extra forces, over and above dispersion forces. These extra forces result in higher melting and boiling points than would be expected from just dispersion. When the ice lattice breaks, hydrogen bonds are broken. (Gent and Richie, 2008). Brown, C. (2009).Higher level Chemistry. Pearson. 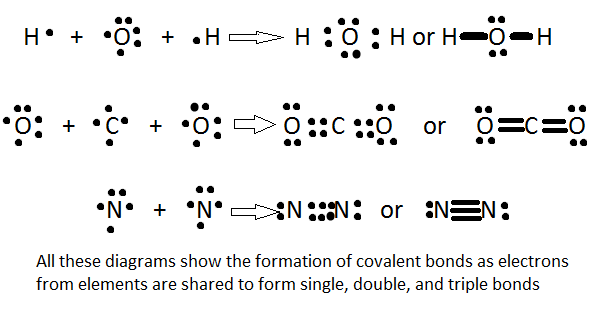 Chemwiki.ucdavis.edu, (2014).Introduction to Chemical Bonding – Chemwiki. [online] Available at:http://chemwiki.ucdavis.edu/Physical_Chemistry/Quantum_Mechanics/09._The_Hydrogen_Atom/Atomic_Theory/Chemical_Compounds/Introduction_to_Chemical_Bonding[Accessed 6 Dec. 2014]. Docbrown.info, (2014).Introduction to CHEMICAL BONDING diagrams descriptions What is a chemical bond? Why do atoms bond together? gcse igcse A Level GCE AS A2 O Level chemistry revision notes. [online] Available at:http://www.docbrown.info/page04/4_72bond.htm[Accessed 6 Dec. 2014]. Gent, D. and Ritchie, R. (2008).OCR A2 chemistry. Oxford: Heinemann. GOODMAN, C. (1960). Ionic-Covalent Bonding in Crystals.Nature, 187(4737), pp.590-591. Herschbach, D. (2003). Cohesion: A Scientific History of Intermolecular Forces.Physics Today, 56(11), pp.68-68. Mikeblaber.org, (2014).Covalent Bonding. [online] Available at:http://www.mikeblaber.org/oldwine/chm1045/notes/Bonding/Covalent/Bond04.htm[Accessed 6 Dec. 2014]. Www2.hkedcity.net, (2014).Ionic Bond. [online] Available at:http://www2.hkedcity.net/sch_files/a/lsc/lsc-chem/public_html/nss/fundamental/bonding/Ionic/eg1a.htm[Accessed 6 Dec. 2014]. "Chemical Bonding Essay." UKEssays.com. 11 2018. All Answers Ltd. 04 2019 <https://www.ukessays.com/essays/chemistry/chemical-bonding-essay-1820.php?vref=1>. "Chemical Bonding Essay." All Answers Ltd. ukessays.com, November 2018. Web. 19 April 2019. <https://www.ukessays.com/essays/chemistry/chemical-bonding-essay-1820.php?vref=1>. UKEssays. November 2018. Chemical Bonding Essay. [online]. Available from: https://www.ukessays.com/essays/chemistry/chemical-bonding-essay-1820.php?vref=1 [Accessed 19 April 2019]. UKEssays. Chemical Bonding Essay [Internet]. November 2018. [Accessed 19 April 2019]; Available from: https://www.ukessays.com/essays/chemistry/chemical-bonding-essay-1820.php?vref=1.